Since dry January didn't really work for me, I decided to embark on fasting February. My will power held on for a whopping 2 hours. Oh, well. During the next tapas bar crawl I would have folded anyway- seeing how croquetas always find their way onto my plate. In Spain they are made of thick bechamel sauce mixture and the result is crunchy on the outside and melt in your mouth magnificent on the inside. That, too, is to come later in this blog. This time I fashioned them out of some leftover mash. These are so delicious that it's well worth it to set out to make too much mash every time. The mash used for croquettes needs to be firm, so go easy on the milk and butter. Otherwise you just might witness the filling evaporating from the crispy shell... If you have used butter and milk, you might want to add an egg or two (depending on the size of your batch) to bind the mixture. Like always when making mash, the key is to steam the potatos until they're completely dry in the pan after you've poured out the water. Another key moment is the breadcrumb coating. 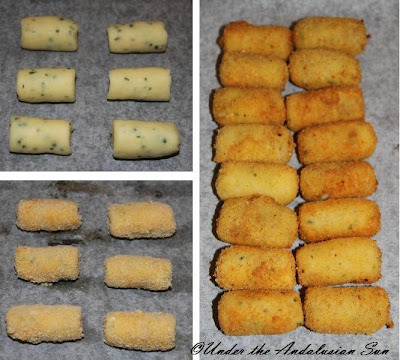 This really needs the whole 3-step-shebang, so first roll the croquetas in flour. Then dip them in whisked egg all over. Then coat them thoroughly in the bread crumbs. This seals the croquetas and makes sure that the stuffing stays stuffed. These can be served as tapas or as a side dish to a steak. 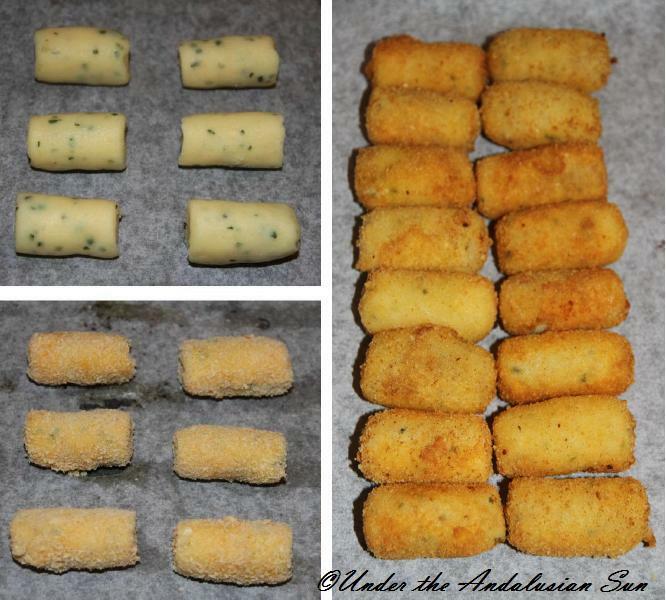 This recipe yields (depending on the size) about 30 croquetas. Croquetas are usually served with mayonnaise, which to us, seems a bit too rich. Mayonnaise actually gives me headache. Which The Gentleman does not wish, of course... So, we like to have these with a dip made with roasted garlic. (The Gentleman hates mustard, so I tell him the dip doesn't have any. But of course it has!) Like any fried deliciousness, these are good with just a slice of lemon or ketchup pimped with some freshly ground black pepper. I roast a couple of bulbs of garlic at a time as there are so many uses for the sweet, brown paste that you can squeeze out of the cloves. Just wrap the garlics in tin foil, toss them into an oven and roast in 200° for around 50 minutes. Boil the potatos until done. Mash (I use potato ricer- perfect mash every time), add butter and the spices (and egg, in case you're using) and leave to cool. Once completely cool, roll into bars and cut into desired size. Roll in flour, then in whisked eggs and finally in bread crumbs. Let them rest in fridge for half an hour. At this point you could also freeze the croquetas for frying later. Heat the oil in a pan. 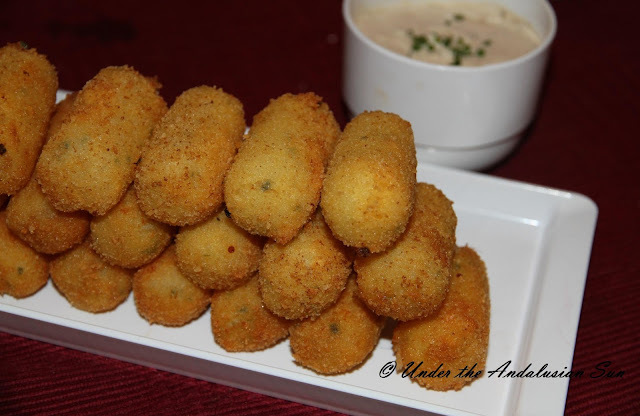 Fry the croquetas until golden brown in batches of 4-5. Drain on kitchen towel and serve. Mix the ingredients together and serve as a dip. Do they have carbs? Yes! Do they have fat? Yes! Are they goooood? YES!